"As a busy college student, I don't have much time to eat, let alone cook. I've been making this soup for myself my whole college career, since it's a soup my mom made when I was growing up. This soup is illegally easy and incredibly good for you. Eat it up! You can add sliced, shredded, or diced cooked chicken to the soup when it is almost ready. This soup is delicious, but it can be a surprisingly dull color. You can make it more attractive by serving it with a thin slice of lemon on top and a sprinkle of chopped parsley or chives." In a large saucepan combine lentils, broth, onion, tomato paste, garlic and cumin. 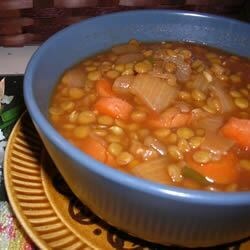 Bring to a boil, then reduce heat, cover and simmer until lentils are soft, 30 to 45 minutes. Serve with a squeeze of lemon. Instead of the tomato paste, I made it with a cup of spaghetti sauce and added chopped celery, and 1/4 teaspoon of garlic salt. My husband loved it, so did I!! Easy and delicious.